Romanticism provides a misleading, ideal representation of the world. It’s a a dangerous human illusion. After the collapse of Rome, Europe plunged into the the Dark Ages. After centuries of stagnation, with increasing social, bureaucratic, and commercial sophistication – ironically aided by the Black Death – the Renaissance blossomed and lay the foundations for the modern world. Soon after, that blossoming led to an appreciation of blossoming itself, and Romanticism. The word ‘romantic’ refers to the ‘romance languages’. Romantic tales were originally those written in a vernacular tongue rather than Latin, hence the name.1)In modern French, a novel is un roman. These typically described chivalric love, i.e., ‘ideal’ love. Which is the problem with the Romantic period. The Romantic thinkers and artists emphasized human individuality, and the importance of emotions over rational analysis. They also argued that the whole was more than the sum of its parts. Those considerations have validity in the emotional world of the arts, but Romanticism is one short step away from the ideal, from imagining that something is pure and perfect, or even imagining that purity and perfection are possible. The Romanticism thinkers opposed scientific reductionism in favor of some ideal. This caught them in their own intellectual trap, because clearly, the ideal itself is a reduction. The ideal is a human extraction and distillation of the best of what we experience, and an elimination of those parts we do not like. Thinking in ideal terms, of course, is inescapable. We constantly experience a flood of sensations, and we must extract out the key components that allow us to recognize what we experience, and analyze it. There is a beautiful tree in our yard, and we can recognize its tree-like attributes: trunk, roots, bark, limbs, twigs, leaves. We might have some idea of its shape and location, and perhaps of its individual peculiarities: a broken branch here, a prominent root there, a lopsided aspect left from pruning or bad weather. But we still know very little about the tree. Neither the finest artist nor the best camera catch the totality of the tree; and they certainly cannot catch the totality of it as the wind blows through the leaves, as the sun moves across it, as the clouds and the weather change the light and the color, and as the seasons roll through. Beyond that, there are the aspects of the tree that we can only experience as an ideal, as minimalized extractions: the complex physiological and chemical process going on in a billion locations, and the incalculable and constantly changing environmental and physical stresses that shape it. Our ideal of a tree is limited to a simplified sketch, a crudely remembered summary, and an abbreviated sense-impression that Romanticism valued. And, of course, trees are exposed to the constant danger and death that all living things face, and to which most of them succumb. Trees appear beautiful, but they are struggling to survive, as are all living things. From necessity, our understanding of a tree is a simplified ideal; our brains extract details so that we can contemplate the tree, because we cannot possibly comprehend it all. So when the student of Romanticism walks through nature, examining only her sensations and emotions, she misses the rational reality that is not sensed, but which must be true. 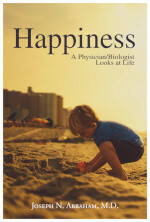 She misses the Malthusian and Darwinian imperative: life is generally a losing battle. And the overwhelming number of living things fail, most of them before they ever have any real chance of succeeding. The reality isn’t pretty, despite appearances to the contrary. Adam & Eve, ideal love: the romantic as Romanticism. Romanticism, like all art and philosophy before the late 20th century, are products of the comfortable classes, the leisure classes. These pampered spectators viewed life from a distance. They saw nature as benign and bountiful, and they assumed that the seemingly happy peasants and placid livestock who lived within it, were sufficient, and free of suffering. But they only saw these things in good weather, in the growing months, when the sun was shining. They saw them in the generosity of the growing seasons, when there was sufficient food and shelter for most people. How many of the Romanticists ever visited those same peasants in winter? Did any of them bother to visit their frozen shacks when there was not enough food, fuel, clothes or warmth? How much disease, starvation, and death did the ideal concepts of Romanticism miss, in the nature all around them, and in the homes of their poor neighbors? They did not see these things, and we do not see these things, largely because we do not wish to. Sir Walter Scott was an important Romantic writer. He wrote of the idyllic ideal of warfare, even though the briefest consideration shows war to be the greatest horror humanity sees. It’s an important point about Romanticism: when you respond to what you feel, not what you think, horror can result. Mark Twain blamed the Civil War, the deadliest conflict in U.S. history, on Scott’s romanticism of battle. The drive-by observations of Romanticism were totally off the mark. Nevertheless, their approach is typical of how we see so many things in life. What we do not see, what we do not feel, we decide is not true; and so we miss the complexity, and the reality. If we do not personally witness or experience suffering and death, then we blithely assume it is not there. And so we drive right past the suffering and death that occur throughout the world, and even in our own communities. And because of that, we ignore the constant pain and death that often lurk around each corner, awaiting each of us. Some of the ideas above were incorporated in my book, Kings, Conquerors, Psychopaths: From Alexander to Hitler to the Corporation. 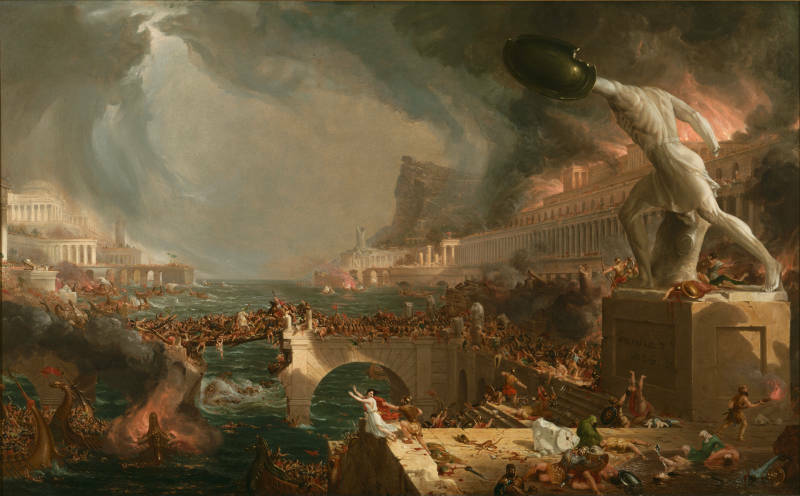 Thomas Cole, The Course of Empire: IV, Destruction, courtesy of Wikipedia. William Blake, 1808, Satan Watching the Caresses of Adam and Eve. Public domain. 1. ↑ In modern French, a novel is un roman.